Extraction 2018 is over, but you can still sign up to be the first to know about future conferences. Click the button above and complete the short form if you are interested in receiving e-mail updates. Find contact information for poster authors to set up one-on-one discussions while you’re at the meeting. Access venue maps, browse the schedule-at-a-glance, and download the exhibit directory to learn more about the meeting. 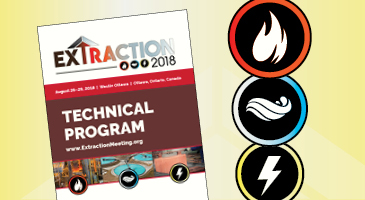 Download the final version of the Extraction 2018 technical program to start planning your meeting experience. View the attendee directory to see who else is attending Extraction 2018 so you can plan on making valuable connections during formal and informal networking events onsite. Please note the directory only includes attendees who have opted in to sharing this information. Extraction 2018 is jointly organized by The Metallurgy and Materials Society (MetSoc) of the Canadian Institute of Mining, Metallurgy and Petroleum (CIM), the Society for Mining, Metallurgy & Exploration (SME), and The Minerals, Metals & Materials Society (TMS). Thank You to the Extraction2018 Conference Sponsors!